I bought a Kindle e-reader close to a year ago because I was convinced it would be easier on my wrists- and while that part was true, I find the hardest part to owning a Kindle is actually buying the books. For years I had been procuring most of my books via used book shops, book sales, sites like Paperbackswap.com or by buying used through Amazon and Ebay. Part of me wished I had known what the e-books cost before having taking the plunge on the reader. I guess I was somewhat naive in thinking that since there was no physical book, that costs cost of an e-book would be negligible. hahahahahahahahaha. While you can find loads of free classics and tons of .99 books, these are the same titles I usually ignore on the "Last Chance" discount tables at the Barnes and Noble. Seeing now how most of the popular titles run anywhere from $6.99-$12.99 or more, (sometimes grrrrr even costing MORE than the paper version) it takes me FOREVER to pick a book for fear of not liking it and well, I can't trade digital books for credit at my favorite used bookstore. I mean what do you do when you don't like an electronic book? I bought that second Tattoo Girl book and couldn't get through the 1st few chapters, so now what? Bye-bye $7.99. One thing that makes me feel a wee bit better about buying e-books is using any Amazon credits I have accumulated. The other day, I actually went on somewhat of a spending spree, telling myself to stop bantering about and just buy the books I've had on my wishlist forever and a day. And so I did. I actually bought ten books. Using Amazon credits makes me feel a lot better when I splurge like this especially knowing that my book brain will be well fed for quite a while. I do know that Kindle book lending options exist, but I'm the kind of person that renews their library books 3 times then still ends up paying late fees. I might gripe and complain about paying for these books but in the end, I am reading and there aren't piles of books all over the house silently mocking me for not having yet having cracked their covers. I can so relate , the price of ebooks have gone up , I had the very first kindle and then a nook and then a nook color and now an iPad . I love the accessibility of ebooks . I used to borrow some when I had the nook but now I buy them . The other day I bought a whole series and it took me a while to get into the first book and I was thinking I am going to have to read them because I already spent the money . Love your list of books , I want to read room and I have heard Chelsea is so funny , you got a great price on that one . I bought an iPad as an eReader, but still prefer real books. I found a 2.99 bargain book on iBooks the other day that was one that I had wanted for some time, so I jumped on it only to later discover that I have a trade paperback copy that I had forgotten about. My in-laws bought me a Kindle for Christmas and like you the cost of some of the newer titles has prevented me from buying a bunch of titles. What I have been doing is buying classic books that typically run $0.00-2.99. Titles like Pride and Prejudice, Frankenstein, The Autobiography of Benjamin Franklin. I'm now reading Crime and Punishment. I remember being forced to read it in High School and hating it, but now without worrying about a paper to write or an English teacher to impress I'm really enjoying it. There's a reason many of classics are classics, they are great books! There are also a number of fledging authors out there trying to by-pass the stranglehold the publishing industry has on books by self-publishing on KIndle. These typically are a couple of bucks and the quality can vary widely, but I like promoting independent artists. You mention being disappointed in a book you've paid for-- are you taking advantage of the free samples? That's part of the fun of a Kindle-- downloading a free sample (usually first chapter) to see if you like the book/ author. 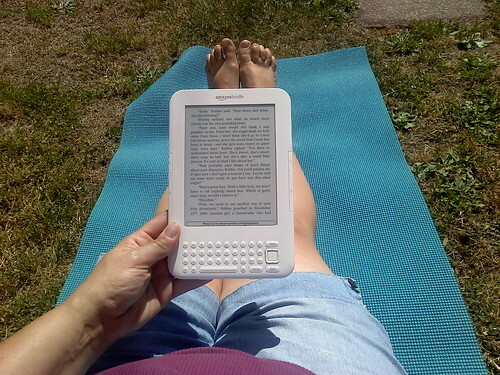 I've tried lots of different authors since I got my Kindle---and have become a reader again! I hear you about the pain of spending money on digital content that has no "reuse" similar to used books. I'm not sure who is making more money on electronic books, but I doubt that authors are! Publishers have dramatically cut or eliminated costs of printing, binding, distribution, and inventory. I haven't stepped into the electronic book reading world yet.